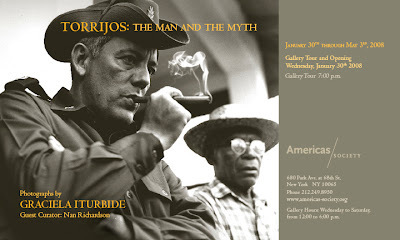 Guest Curator and photo editor Nan Richardson provides a background and context for Graciela Iturbide's photographs in this exclusive exhibition tour at the Americas Society, tonight, Wednesday, January 30th. Reception will follow from 7:00 to 8:30 p.m.
For more information, visit http://as.americas-society.org/index.php. What a jet-lagged New York blogger, a glass of champagne and a sushi roll have in common? Nothing I would answer but the sushi with the champagne can help her stand at her feet! I was jet-lagged and slightly tired but I couldn't miss OMIDO restaurant’s Grand Opening Press Preview. As a New York events blogger, I have an obligation to attend but also an excuse to new tastes, people and venues. OMIDO wasn't a disappointment. 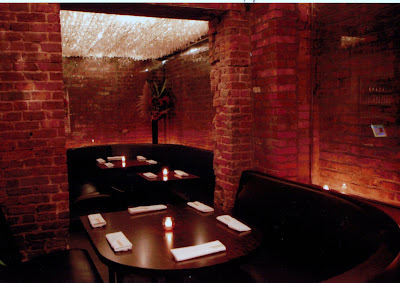 Its edgy and sleek style coupled with Japanese cuisine give an extra buzz in the hustle and bustle of midtown. Close to Broadway and next to the David Letterman Show, it is ideally located for theater-goers or even tourists! I tasted or rather ate various fusion rolls and makis: foie gras -toppe, gold-leaf-anointed temari with salmon, tuna and yellowtail all excellent and well-balanced. Not to forget the nigiri and sashimi equally presentable and tasty and the refreshing Mango Parfait dessert. I was pleased with the quality, the flavors and also the colors while watching master sushi chefs crafting the art of sushi making. 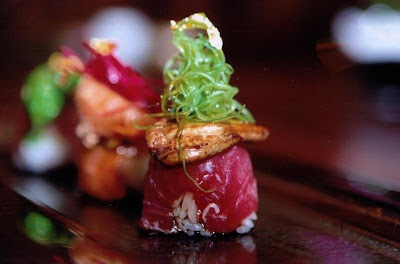 Renowned sushi chef Eiji Takase is not new to the sushi world: Former Executive Chef of Sushi Samba and Shibuya at the MGM Grand in Las Vegas reinforces his merit and experience by fashioning each Omido dish with the same attention. I am sure journalists and bloggers who attended have good things to say and write about this cosy sushi bar/restaurant. Together with its reasonable prices will make it a great hub for sushi lovers! 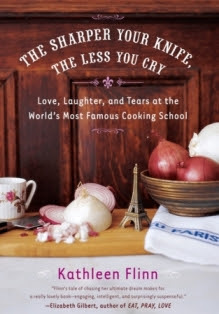 The Sharper your Knife, the Less You Cry was the book showcased yesterday at the James Beard Foundation's Dining Room. Kathleen Flinn, the author, gave an outstanding presentation of her personal story-biography mixing salty tears with delicious laughter and jokes. As a Gordon Bleu graduate and journalist (but also former executive at MSN, London), wasn't convinced about the choice she made in 2003. She as well ignored where following her passion would take her: a world-known culinary diploma, a pretty good book deal and also a marriage! Although the correlations between cooking, discipline, writing and living your passion were blur to me, I undoubtedly admit that while studying at Cordon Bleu school in Paris, she had to face challenges but also major successes on all levels and areas of her life. Unfortunately, there are no recipes for success in life. What worked out for Kathleen Flinn may not work so well for someone else. Living your passion does not always guarantee positive outcomes (even I really really want to believe that). Living happily ever after may apply in her case, but it's not the case for all human beings. The good news is that she created a fun, insightful and entertaining book. And also that she proved with her life, that the first element to success is the following: Be Born Lucky. There are mainly three reasons to visit a café in New York City (or elsewhere): good coffee, tasty snacks and nice people/environment. Tillie's café in Brooklyn has all three and it adds a few more on its list: free wifi, excellent customer service, nice neighborhood in Clinton Hill and art exhibitions every other month. There is nothing missing from this local coffee shop! Choose any type of bagel (with cheese, jelly or peanut butter), try the croissants, or go for the very Floridian taste of the Key Lime Pie. There are light lunch options available and you get your favorite Orangina too! If you like the arts, don't miss to visit before the end of February to view Ramona's Candy colorful paintings, collages and prints. 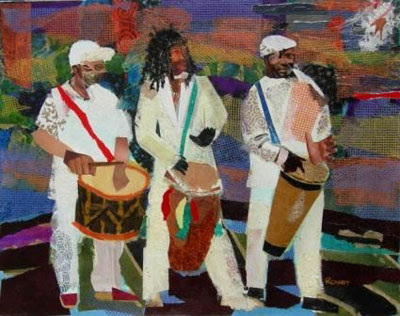 Named as the Choreographer on Canvas and with great influences from her Haitian/Caribbean heritage, Candy's paintings will add some light in your dark winter days! There is no reason not to visit this café if you live in Brooklyn or as an alternative choice to avoid the Manhattan crowds. The Gym Project is back! Twice a month, I will review gyms/health centers/pilates studios and more as I used to do last year. Here is my first posting for 2008! Visiting a gym just across the Wall Street Stock Exchange Market, it’s a fun way to start your exercise routine. While you are getting ready psychologically and physically for a machine workout or an exercise class, tourists wonder leisurely around, taking pictures and eat burgers, hot dogs or chocolate-chip cookies. You frown. You decide that you should take advantage of living in the Big Apple and starting tomorrow, you will explore the city daily (with a burger too). But then, you open the door, leaving behind you those people who witness (without realizing) one of the biggest economic centers in the world and you face an amazing and peaceful two-storey building, with plenty of stair masters and treadmills, TV stations, magazine racks, a café, a spa, a steam room and a few exercise studios. Welcome to Equinox Wall Street! The changing room is spacious and clean, free towels are available, so are the lockers but bring your own lock. Expect to find, except for shampoo, conditioner and body wash, shaving cream, mouth wash, cotton, hair spray and body lotion (I am sure I forget a few). There are blow-dryers to use, tissues and plenty of mirrors! You have a great choice of classes you can attend: From Pilates to Yoga, to Maximize, CoreFLEX, WillPower & Grace, Body Conditioning, Abdominals, EMS Training, Tread & Sculpt, and more. You can also try the Studio Cycling taking place in its own studio. I tried several classes but I will stay on the Maximize. This, 45-minute class, it is enough to keep your body toned for the following three days. Initially, you think that it will be a quick, easy and fun body conditioning. The fact is that Maximize is more than that. The warming up is too fast and you experience your first sweats. When the time comes to use the “ball” (instead of the bar or weights), while doing lunges and trying balance exercises, you wonder why you chose this class in the first place. A random glance at the clock will reassure you that you still have plenty of time to finish. Then you alternate to the weights, go back to the “ball” and you finish off with stretching. Yes, Maximize is a challenge. But a good one! Not the same solo features three renditions of "News," a recent solo by choreographer Deborah Hay, adapted and performed by three different performing artists: Ede Thurrell, Layard Thompson, and Brandin Steffensen. Each artist has practiced News daily for no less then three months, and adapted the solo through Hay's rigorous Solo Performance Commissioning Project. Three distinct renditions of News will simultaneously share the eclectic personality of each artist and offer New York City the rare opportunity to witness Hay's recent solo through revealing juxtaposition — each adaptation a contrasting view into the wonderland of Hay's choreographic universe. Thompson, Steffensen, and Thurrell challenge perceptions of time and space, as well as definitions of choreography through this esoteric and poetic dance. Wine Wednesdays started as an excuse to share a few wines, cheese and conversation with clients who visit the store. It's more social than serious - and very informal. It's a fun way to try before you buy - or just try. No strings attached. It's free. And if you don't think that's enough fun, Burgundy Wine Company is also featuring a little jazz to jazz up your tasting. 5:00 to 7:00 p.m.
As a social event blogger and serial networker and party-goer, I always thought that I am invited to all open events. Those asking for a RSVP, I do RSVP them and so far, I never had a problem at the entrance. I have always been accepted and welcomed. Events are for people and without them can't really exist. Admit it, who wants to organize an event with no guests and participants? Which guest would like to attend an event with no people? None. Some event organizers though, despite the open door policy, do discriminate. Because they pretend to be high-class, they pick and choose people at the door and they want to make a statement or to show their power. They are so much mistaken. Chelsea Gallery openings in New York City on Thursdays are traditionally open to the public for free and do not require a RSVP. 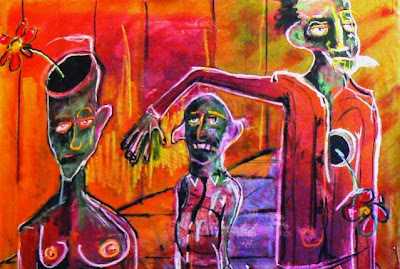 With the exception of few private gallery openings that keep their door closed with a note saying: Private Party. There is only one gallery, a pretentious one, I should say that has a different approach. The Amsterdam Whitney Gallery does not welcome everybody. The police woman at the door selects the ones she likes (based most of the times on clothes or just the face). The gallery owners tell you that "this is a private party" so as to get rid of the unwanted ones. 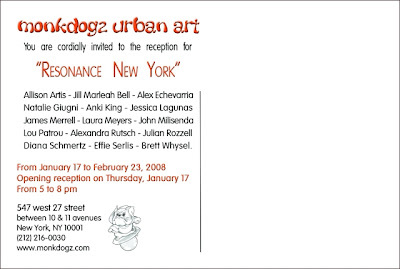 At the same time, they circulate postcards with details of their opening in the very same building that reads: "You are Cordially Invited to Attend Our Gala Opening Champagne Reception Beaux Art and New Year's Ball", Thursday, January 10 2008. And then, when you show up, they easily kick you out. I was the one of the numerous kicked out last Thursday by a woman who was cynical and cheap. I remembered last summer that another door person (of the same gallery) didn't allow a guest in jeans to come in. She found her way back with the crowds and when I approached her, we both laughed at the ridiculous behavior of the gallery people. She then told me that she was a journalist. That's why open to the public receptions and parties should respect everyone. Because organizers do not know who may be at their door. One day may be a journalist or a blogger. Another time may be an art buyer. Gallery owners should realize that they need all those people - the journalist and the blogger and the art buyer. Without them - us- can't do much. They need coverage and they also need sales. Although I don't buy art myself, I know many people who buy and I often talk to them about the shows I go. Will I ever talk about the Amsterdam Whitney Gallery? I have no intention to do so. I am not supporting party crashing. Not at all. In a city like New York, party crashers are everywhere and most of the time, seem to enjoy their life. But that's a different story or approach to "going out" without being invited. I am not a fan of it and I don't do it. There is something exclusive with RSVPs that I don't want to miss. But unless there is a closed door with a note "private party" on it or someone with a check-list, the Amsterdam Whitney Gallery will have to accept all people coming in instead of pretending having a "fake" private party. Because journalists, bloggers, art buyers and the public will also become "fake" party crashers. The other solution is a change of their invitation. Replace the "You are Cordially Invited to Attend " with "You are Cordially Unwanted to Attend". And correct the spelling mistake in Beaux Art. That will be a good start for the new year. It seems that "corporate" ad-hoc lounges that opened before and during the holiday season have closed their doors: The Wired store closed at the end of the year, the Delta 360 lounge just before Christmas and the Illy caffe push button house ended its free espressos with 2007. Each end is a new beginning, experts say, so don't complain. Read the news about a new "room" created by Artists Space. Time for culture! Artists Space has announced a new programmatic space, called the Blue Room, with an inaugural event on Saturday, January 12. The Blue Room is a flexible area within Artists Space dedicated to improvisational discourse. A hybrid between library and living room, this addition to Artists Spaces’ program allows for informal conversations, lectures, small gatherings, and performative projects. Including an always open and ever-changing curated library of publications, the Blue Room is in constant transition as it reacts to issues of the day. Artists, curators, writers, and all members of the Artist Space community have the opportunity to organize and schedule events in the Blue Room. The goal of this exciting new space is to further artistic experimentation by providing a location for anyone to propose innovative programming. Blue Room events are open to the public, however an RSVP is mandatory. Please reply to rsvp@artistsspace.org and indicate the date and title of the event in the subject heading. 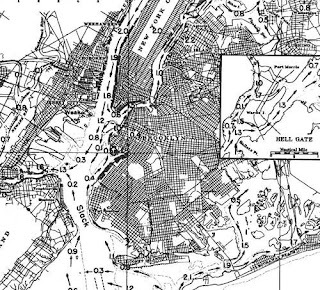 Saturday, January 12, 5:30 p.m.
Hell gate, a narrow strait at the convergence of the East River and Harlem River, has the second fastest tidal current on the planet and is the site of the second largest civic disaster to happen in New York City (in terms of lives lost). Marie Lorenz will talk about the current in Hell Gate and how to swim out if you find yourself there. A monetary unit is a thing of value in more ways than one. Money can be treated as legal tender, a historical document, as well as a tool of utility. The notion of "relative rarity as a value index" will be discussed along with specific case studies that illustrate the fluid nature of currency. Is it possible to 'beat the system'? Melissa Brown will talk about methods to chart, tally and capitalize on idiosyncrasies within the New York Power Ball game. See you at your book signing! Very soon I hope.